So what player was the biggest eye opener for you? "Definitely Dirk Nowitzki. He's just unstoppable. You think he won't post up, but then he posts up. So you guard off him to keep him off the block and he pulls up and shoots a three. His talent is just amazing. He really is as good as people say he is." Last edited by Underdog; 04-09-2016 at 02:35 AM. Dirk is great, And I'm sorry and no racism is intended here but If Dirk was a black man he would be called one of the greatest of all-time imo. But since he is a tall white guy from germany he is called soft and weak and a choker. I don't care though because I expect Dirk to lift the Larry O'brien trophy in front of all of the people who criticize him. Last edited by LSMF; 03-17-2008 at 07:11 PM. Is "nowitzki" the German word for "humble"? Last edited by Underdog; 03-17-2008 at 11:41 AM. yeah...i'm totally gay for dirk. Dirk is great, And I'm sorry and no racism is intended here but If Dirk was a black man he would be called one of the greatest of all-time. But since he is a tall white guy from germany he is called soft and weak and a choker. I don't care though because I expect Dirk to lift the Larry O'brien trophy in front of all of the people who criticize him. Unfortuantely you are right about every all of that. How people conveniently forget all the great things he does, and single out minuscle mistakes is amazing to me. 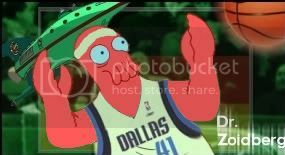 I was reading ok lakerground.net a couple of weeks ago that Melo was more clutch than Dirk. Yes, that Melo that has yet to win a first round series. Why? Because last year he hit two clutch jumpers. While the countless that Dirk has hit are always forgotten. One of the top 10 greatest power forwards of all time? I could argue for that, the man is a revolutionary. All Hail....I'm in the opinion that Dirk is having his best season yet. I say that because I think his defense and passing have both improved fairly dramatically this season. He also looks the strongest that I can remember. Def top 10 pf of all time. It's really messed up the things that have been said about Dirk, if Dirk was the one who shot 97 freethrows against the Miami cheat I bet you everyone would have said the series was rigged and everything but since it was Wade people will just say "Dirk is a choker". It's not fair and that is why I say the Mavs must crush the whole Nba. And then I want to see Dirk win the championship, That way all of the troubles Dirk went through in his time in the Nba will not be in vain. And the great thing really is that it is very possible for Dirk to climb the mountain(Rings!) very soon hopefully. Last edited by DevinHarriswillstart; 03-17-2008 at 12:02 PM. Don't ever post this again... Ever! As a matter of fact, could someone make a virus that can delete this pic from every hard drive on the planet? Definitely top 10 if there are other PF's in history in that mix that haven't won it all. If there aren't, then as much as I hate to say it, I don't believe Dirk deserve to be in there. However, if we were ever to win a championship, Dirk skyrockets into a debate for being the GREATEST of all time imho. Dirk is never going to be considered the greatest PF because of his defense. You have to be great at both ends to be the greatest. However, having a title is certainly not a prereq for being a great at your position. At PF that is certainly true, as Malone and Barkley would probably be in just about anyone's top 5 PF's of all time. Last edited by jthig32; 03-17-2008 at 12:11 PM. You have to put Malone in the top ten and he's never won a championship, I know a lot of people see KG's name in there too... Barkley? Yeah, Dirk has to be on that list. uh...how about top 5 when all is said and done. I'm sure the numbers will back that up. Last edited by Evilmav2; 03-17-2008 at 12:21 PM. not in order...Duncan, Barkley, Malone, Dirk, KG....projecting stats...who would you guys put in here that would bump Dirk?? Moses?...McKale? Greatest European is in the bag. Great foreign player is difficult to define. If Hakeem counts, Dirk isn't touching him I don't think. If it's greatest foreign born that didn't attend an American college...you probably have a discussion there, I think. If he wins a title, he will be in a lot of conversations as top 5 PF of all time, I think. McHale and Bob Pettit would be the next two names most people would bring up, I think. I pooed my pants when he obliterated Phoenix in the 2006 playoffs by himself. The article the next day: Deliverance. I would probably put Duncan, Malone, Barkley, Pettit, and Mchale ahead of Dirk as of now. As of June 2, 2005 the experts apparently had Dirk at #10. I still think it's crazy Garnett is ahead of Dirk... and I think it's even more crazy people would still put him ahead of Dirk. He's done nothing more than Dirk has in his career. We'll see how it plays out but ideally I would like to think him being a revolutionary at the 4 would move him up higher on the list as well as being hands down the best European player. Mchale gets the nod because of his championships, I know it's not a prerequisite to be on the list but if Dirk was in his position he would also be a second banana. Can't fault him for that, especially with three championships (more than Dirk, Garnett, Barkley, Pettit, Hayes, and Malone combined... wow). Dirk would not be second fiddle to Kidd...Kidd is the support of Dirk...not the other way around. I agree that the media would present it as Kidd then Dirk...but that is bc they love Kidd and dislike Dirk. Dirk is the #1 on this team...don't loose sight of that. if they win a ring...it will be on Dirk's back. McHale is clearly a second banana to Bird though. Dirk's offense is more superior to KG's offense than KG's defense is superior to Dirk's defense in my opinion. I meant if Dirk was on that Celtics team with Bird, I agree this is still Dirks team no question. You can't fault Mchale for being on a team with a superior player when it produces three championships, the same would be true of Dirk. Clearly the analysts did fault him a bit for being a second banana since Barkley and Malone (0 rings) are higher. Last edited by sike; 03-17-2008 at 01:37 PM. if a person isn't going to put Dirk in the top 10 because his d is too weak, then that person ought to think twice about Malone as well. I never thought he was anything special on the other end of the court. and barkley too -- talked a big game, but Dirk would have lit him up for 75 points a game if he had barkley guarding him..
Dirk was a rather weak defensive player the first 5 years of his career...but these last couple years his defensive improvement has gone largely unnoticed...but his is a vastly improved defensive player. Yah, I also don't believe that the way he is viewed has anything to with his race. Last edited by sike; 03-17-2008 at 01:54 PM. yeah -- he's got Karl Malone's only defensive move, a strip, and a lot on top of that. it really struck me in the Nets game last week just how much the mavs had missed dirk's defense in the previous game v. the rockets. he is solid off the ball, solid blocking shots, solid man on man....not great...but I think more than passable...he might even be nudging closer and closer to a "good" defender. The image in most people's head will be of Lebron monster dunking over Dirk at the all-star game in the closing minutes, not giving him any credit for any thing else he's done defensively. Last edited by MavsWiLLHaVeRinGs; 03-17-2008 at 02:01 PM. Agree, word to that. Barkley got dunked on by Dirk when he was like 17 years old. Look it up on youtube. Also, add to the defensive arguement, he's a more than capable defensive rebounder.